There’s lots of talk about UX Writing and hiring writers to help design copy for your product, but what does that actually mean? And how is it different from working with a copywriter? UX Copy is a hyper-focused discipline within the world of writing: it’s about crafting the voice your product projects into the world, and understanding how others interpret that. The UX writer distills that knowledge into a voice, and creates a repeatable system for the way your product speaks to users. As a result, UX writing often sits somewhere within the design organization of your business, as a part of the design process before a product is built. That’s intentional, ensuring your product is able to speak to users effectively. There’s a lot of ways UX writing is great for business, so I thought I’d share what it’s like to work with a UX writer from my own perspective, and how UX writing can help your business. You’re probably accustomed to working with copywriters, but there’s a big difference when it comes to the world of UX writers: it’s less about flashy copy, catchy sentences and cute wording. UX Writing is about considering the overall flow and implementation of a design, and how it guides a user through it. It isn’t about giving the user cute error messages like “oh no, something went wrong,” but is focused on providing them with a clear path forward through the use of copy. For users, this was confusing. Not because they were stupid, or unable to understand how to move forward, but that they actually didn’t want to complete the task the button implied much of the time. Putting a blocking step that says “Get my API key” when a non-technical user signed up meant they figured it was the wrong place, and started trying to exit the flow. This is called ‘moving the cheese’ which alludes to a mouse trying to get to where it wants to be, but the final destination seemingly not on the horizon. We made a number of changes to the flow, including the use of titles and descriptions to help the user understand if they needed to do something, and most importantly, a consistent way to move forward. If you’re building an onboarding flow, or helping your users for the first time, copy is one of the most important tools you have to help people with difficult to understand concepts. Looking at it from their perspective (and in many cases, identifying what type of users are the audience), then guiding them forward so that it’s always clear what’s next is key. UX Writing can do a lot of heavy lifting for you, if your writers understand what’s going on and are able to help translate that for the user. As a writer with a technical background, I’m allergic to jargon like ‘authentication error’ or ‘gateway unavailable,’ because it means nothing to your users! The job of a UX writer is making it incredibly clear to the user what’s happening both when something in your app goes right and when it goes wrong. A good UX writer should understand the technical details of what’s happening, and translate this into something coherent, simple and actionable for the user so that they always have a way out of a dead end. Authentication error:  Unable to access this system. I hate these errors, because they’re written by developers, and I can’t even understand what’s wrong here. Did I do something wrong when trying to log in? Is the system down? Do I not have adequate rights to log in? Sorry, your account details were incorrect. Reset password here if you're stuck. Our services are unavailable right now, so we can't log you in. Try again soon. Your account needs permission to access this area. Click here to message the team owner for help. All of these messages tell the user precisely what went wrong, why, and don’t leave them hanging wondering what’s next. When developers are left to fill in text in an application, they tend to do so by being overly verbose, or adding way too much text that adds little value to the message. In the fantastic book On Writing Well by William Knowlton Zinsser, he says that “the secret of good writing is to strip every sentence to its cleanest components.” You should seek to do the same across your product, because it offers a refreshing change of pace: getting directly to the point. The iPhone (Name) is synced with another iTunes Library on (Computer). 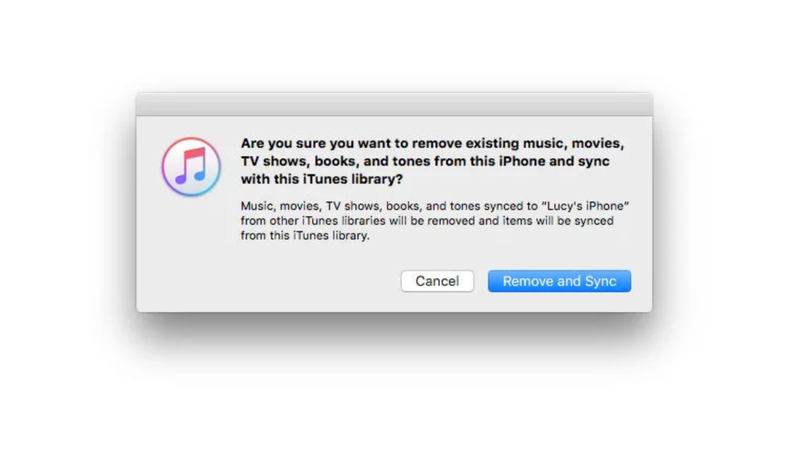 Do you want to erase this iPhone and sync with this iTunes Library? An iPhone can be synced with only one iTunes library at a time. Erasing and syncing replaces the contents of this iPhone with the contents of this iTunes library. The first line of text was enough to make me panic, and not bother reading the rest; You’re going to wipe my iPhone? Please don’t! The second line actually clarifies a little bit that this is about music, but it doesn’t offer up any reassurances it won’t just wipe the entire phone. Worse still, the button says Erase & Sync which is not reassuring. *Do you want to replace the iTunes library on this phone? * You can only sync an iPhone with one library. Continuing will remove iTunes so you can sync with this computer. Replace iTunes library? Continuing will remove iTunes content from your iPhone so you can sync music from this computer. As for the buttons: OK and Cancel would suffice with the text re-written, given we aren’t planning anything destructive. Rachel Mullins has a fantastic article about how to apply these practices to your own app if you’re not able to hire a UX writer. Simple steps and a set of rules about how you talk to users goes a long way! The best thing you can do for your business is bring UX writers in early, as you’re first imaging what your product might look like, to help craft copy that forms a tight knit with your design. The way your products speak to users are what they’ll remember, and getting it right the first time can grow your business in the long haul. If you ever need help or advice, I’ve worked with lots of products, big and small, and love hearing about the challenges teams face talking to their users. Say hello!